Having long been a neglected issue, the policing of protest began to attract considerable attention in the 1990s, climaxing in the events in Seattle of 1999. These protests and the changing political climate since September 11, 2001 mean that a new cycle of protest is challenging the concept of law and order and civil liberties. This book examines how new policing styles are developing using case studies from North America and Europe. The volume brings together researchers from a number of disciplines - sociology, criminology, political science and mass communication - who focus on new forms of political protest, policing and public order. 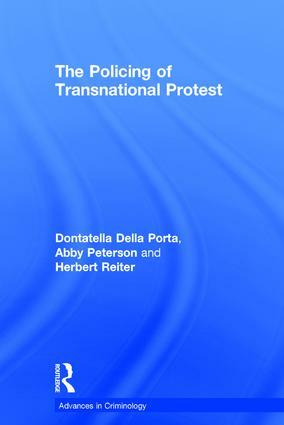 Contents: Policing transnational protest: an introduction, Donatella della Porta, Abby Peterson and Herbert Reiter; The policing of global protest: the G8 at Genoa and its aftermath, Donatella della Porta and Herbert Reiter; Policing contentious politics at transnational summits: Darth Vader or the Keystone Cops?, Abby Peterson; The policing of transnational protest in Canada, Mike King and David Waddington; Aspects of the 'new penology' in the police response to major political protests in the United States, 1999-2000, John Noakes and Patrick F. Gillham; Negotiating political protest in Gothenburg and Copenhagen, Mattias WahlstrÃ¶m and Mikael Oskarsson; Formalizing the informal: the EU approach to transnational protest policing, Herbert Reiter and Olivier Fillieule; The policing of transnational protest: a conclusion, Donatella della Porta and Herbert Reiter; Bibliography; Index. Donatella della Porta is Professor in the Department of Political and Social Sciences at the European University Institute, Italy. Abby Peterson is Professor in the Department of Sociology at the University of Gothenburg, Sweden. Herbert Reiter is based at the European University Institute, Italy.